Now that it is slowly cooling off it’s time to get my soup groove on again. I just love soups, so versatile, easy and healthy. Let it sit on the stove all day and it’s ready to eat by dinner time. That is very important to me on swim days when I don’t have time to cook at dinner time, it must be ready as soon as I arrive home with three very hungry boys! 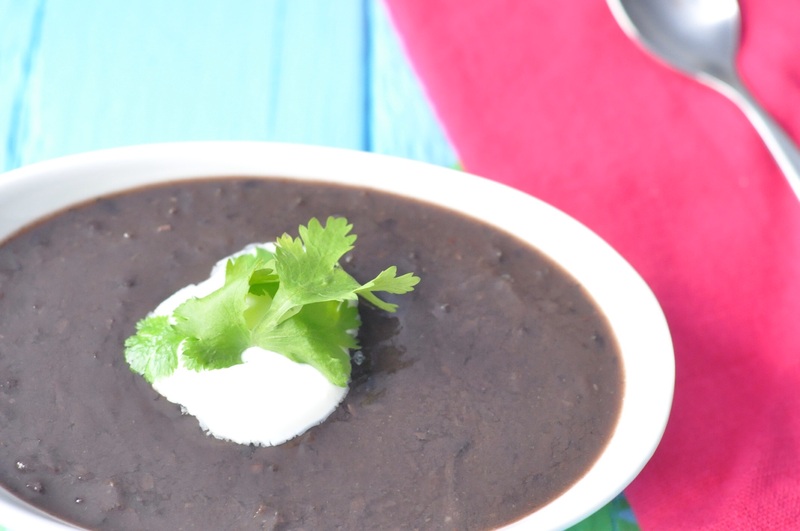 Not only is this black bean soup easy and healthy, it’s also pretty darn cheap. A bag of dried black beans won’t set you back much at all and the rest of the ingredients are usually around the house anyway. 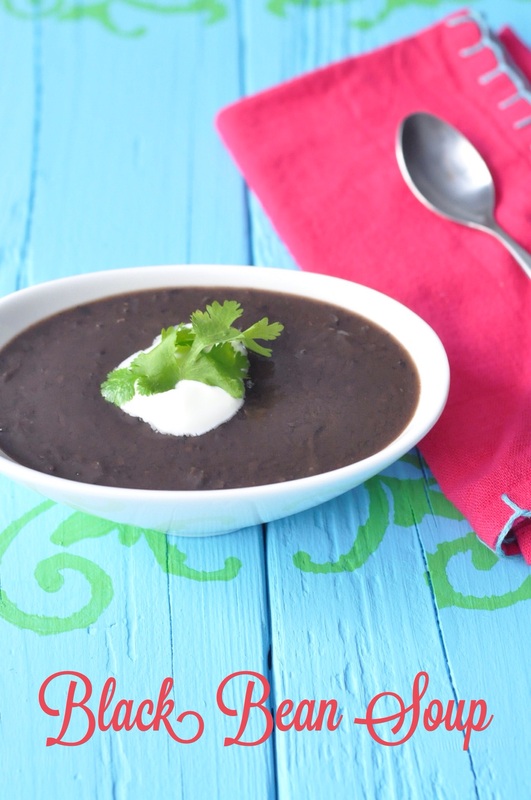 I love a good black bean soup. It’s so full of protein and fiber. Perfect if you have any vegetarians over for dinner. I also enjoy making my own because I can get the texture I want and it all depends on my mood. Sometimes I want it mostly whole beans, other times partly puréed and other times completely puréed. This soup was a hit with the kiddos. They enjoy it with a dollop of sour cream and crushed tortilla chips. Another bonus, I can heat it up in the morning and pack it in a thermos for school lunches. Talk about a quick and easy school lunch, makes my morning run smoother! Soak the beans overnight by placing them in a bowl with about 8 cups water. Rinse and drain the beans the next day and place in a stock pot. Fill the pot with cold water to about an inch above the beans. Add the onion, peppers and spices and bring to a boil over high heat. Cover, reduce heat to a simmer and allow to cook for 4-5 hours. Once the beans are fully cooked you can purée the soup if you desire. Either use an immersion blender or pour into a blender and blend as much or little of the soup as you wish. * Optional garnishes included sour cream, Mexican crema, chopped scallions, cilantro, tomatoes, avocado, tortilla chips etc. This entry was posted in Soups and tagged budget friendly, easy, frugal, gluten free, inexpensive, kid friendly, Soup, vegan, vegetarian on October 1, 2015 by Gretchen. I love the texture of your soup…..It’s nice to have some bites of bean. I can’t wait to try it :-). I mostly go for partly puréed, but now and then I want it completely smooth! Enjoy soup weather, we are having another soup tonight and the weather cooperated with cooler air and a great breeze! I love all the fall weather! Soup season is the best. Now we just need to dry out…. 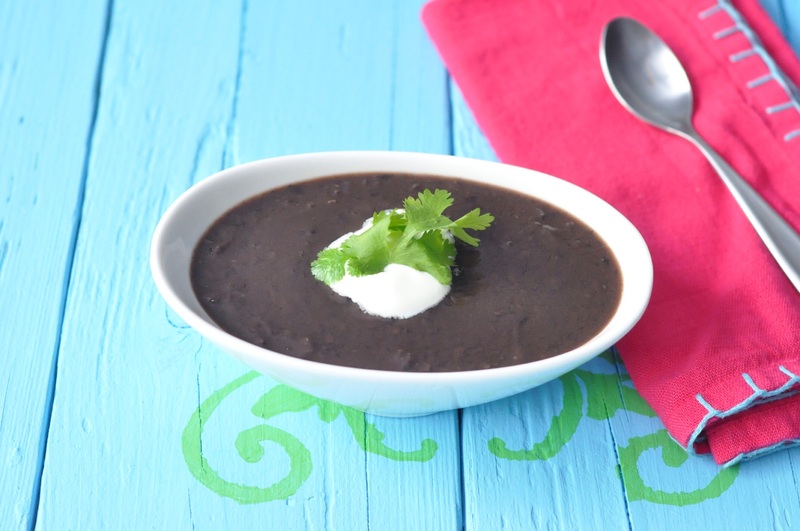 Black bean soup is a favorite of mine, too. Like you, this is the time of year that I put up a pot, freezing most for the coldest days ahead. I’ve never made it spicy in the slightest but your ingredient list makes me want to rethink that. I bet a little bit of spice would be very good. Thanks, Gretchen. I love all kinds of bean soups, so healthy and pretty easy. It’s the time of year for big pots of soups and a stash in the freezer! The header photos are almost a year old now, my now time flies. Guess I need to work on some new ones again. Thanks for stopping by. I have never pureed bean soup but it does look nice and I want to try that the next time I make some bean soup. I usually blend my red-lentil soup and it tastes great. I have never blended red lentil soup. I like my black bean soup part whole bean and part blended. I guess it’s a texture thing for me.